This entry was posted in Microsoft Student Partners and tagged Blog, Presentation, TechNet, Webcast on 18. October 2011 by Daniel. This entry was posted in Microsoft Student Partners and tagged Events, Hyper-V, Microsoft Student Partners, Presentation, SCOM, SCVMM on 20. September 2011 by Daniel. This entry was posted in Microsoft Student Partners and tagged Blog, Presentation, TechNet, Webcast on 13. July 2011 by Daniel. Kleiner Eindruck vom Springboard 2011 gefällig? 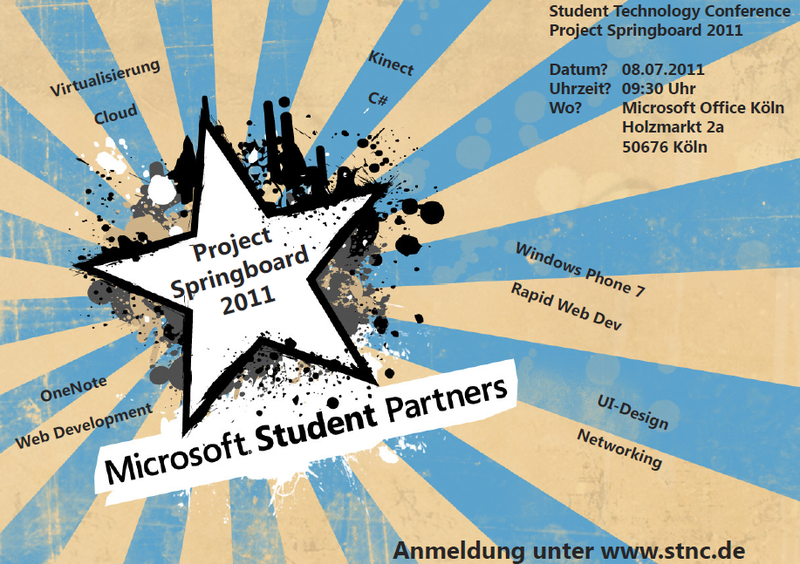 This entry was posted in Microsoft Student Partners and tagged Community, Events, Microsoft Student Partners, Party, Presentation, Studentenleben on 13. July 2011 by Daniel. This entry was posted in Microsoft Student Partners and tagged Community, Microsoft Student Partners, Networking, Office, Presentation, Programming, SCVMM, Virtualization, Windows Phone, WP7 on 19. June 2011 by Daniel. This entry was posted in General, Microsoft Student Partners and tagged Blog, Presentation, TechNet, Webcast on 23. March 2011 by Daniel. This entry was posted in Microsoft Student Partners and tagged Community, Microsoft Student Partners, Networking, Presentation on 24. March 2010 by Daniel. This entry was posted in IT and tagged Exhibition, Internet, IT, Presentation, Server on 5. March 2010 by Daniel. This entry was posted in Microsoft Student Partners and tagged Community, Microsoft Student Partners, Presentation, Studies, Windows on 5. October 2009 by Daniel. This entry was posted in IT, Microsoft Student Partners, Studies and tagged Events, Microsoft Student Partners, Presentation, Studies, Windows on 26. August 2009 by Daniel.